Continuing from previous article on energy saving tips – house wall insulation, in the case of cavity walls, insulation is applied by filling the gap between the two wall layers with insulating material. What a good performing insulating material does is to keep heat inside in winter and keep heat from entering in your home in the summer, thus increasing your house’s energy efficiency and reduce your energy expenses. If you are looking for an insulating solution for your home you might have already realised there are numerous product solutions in the market. You should keep in mind that insulation is not just about the internal temperature of your home; the materials you use for your insulation will have an effect on other areas of your internal comfort and/or on the overall condition of your house. These include the internal humidity, ventilation, fresh air supply, level of condensation and, consequently, the deposition of condensation inside your walls and fixtures. It is thus of ultimate importance that you have a solid understanding of the basic principles involved in home insulation and insulating materials and insulation methods especially before deciding amongst different alternative solutions. Why should I insulate my home walls? As already illustrated in energy saving tips for home, poorly insulated walls account for about 35% of total house heat losses. Estimated figures for insulating walls of a semi-detached 3 bedroom home with gas heating and cavity walls show that energy savings achieve investment payback time within a year! House external walls are cavity walls with nothing filled in the gap. 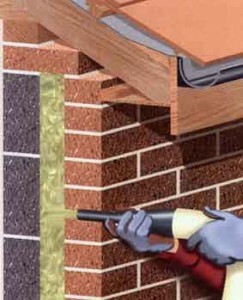 The construction of your house walls allows for filling the gap with insulating material. The market on Wall insulation materials has been booming in the past years and is expected to continue on this trend given the shift towards green building and energy efficiency in the construction sector. Standard materials usually range between polyurethane foam, expanded polystyrene, mineral wool and related insulation materials such as glass fibre wool, rock wool panels. 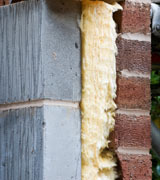 In an existing cavity wall, you can have insulation blown into the cavity from the external wall. What is of ultimate importance is that you should insulate all of your external walls in order for the insulation to be effective. The usual process involves drilling holes on the external wall layer of about 25mm to pass blow-fill gun that blows the insulation foam. The process is repeated at 1meter intervals until the whole surface area is filled. Once done, the holes should be filled with same material s the external wall (usually brick). If you are not involved in this work it is best to assign this job to a professional. You may also like green building design, energy saving tips at home, energy saving tips for summer and energy saving tips for winter.